1. Heat oil in a wok or fry pan and stir-fry the pork for two minutes. 2, Remove stems from the mushrooms and quarter them. Then add them to the pork and stir-fry another minute. 3. Add all the rest of the ingredients and stir-fry for another two minutes. 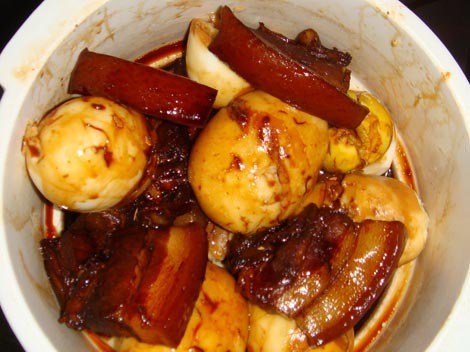 Remove pork, mushrooms, and eggs from the sacha sauce liquid, cut the eggs in halves or quarters, and serve hot or warm.